Storms. Photographs by Mitch Dobrowner. The current exhibition at photo-eye, Storms by Mitch Dobrowner, is in celebration of his forthcoming book of the same title published by Aperture. Dobrowner’s new book, due this September, will feature 51 of Dobrowner’s storm photographs with an introduction by poet and novelist Gretel Ehrlich. Dobrowner's photographs have always focused on the landscape with an interest in weather. A few years ago he took his work to a whole new level when he started chasing big storms with the assistance of professional storm chaser Roger Hill. In Dobrowners images we experience breathtaking acts of mother nature, sometimes dark and frightening, while equally sublime. Anne Kelly: You are currently in the process of working with Aperture to publish a book featuring your storm photos. How did this come to be? Mitch Dobrowner: I was approached by Chris Boot at Aperture last year after he saw my work. At first I wasn't sure about doing the book with Aperture as I was in talks with another publisher, but Chris was so passionate about the project. After doing some research, talking to my galleries and friends -- and a few conversations with Chris -- I felt comfortable with both him and Aperture and the book became a reality. Also, by being so heavily influenced by both Ansel Adams and Minor White, it is still hard for me to believe that Aperture will be publishing my work. AK: You were recently on press — tell us a little bit about the experience. 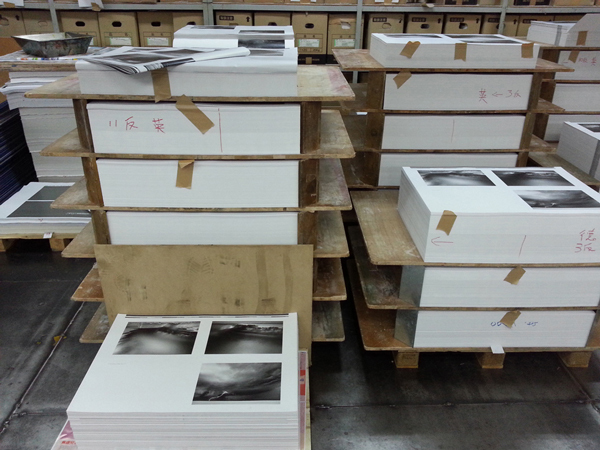 MD: Being on press for the printing of the book was invaluable. Because Aperture arranged for the pre-press and production of the separations to be performed in Los Angeles (local to me) by Escolon, I was able to be involved with the creation of the separations -- and approve all the pre-press match prints. That gave me a running start and a great feel for the book and its production process. Once at Asia One (printer) I was able approve each image as they came off the press. I was able to help choose the proper screening method for the printing (ie: stochastic/tradition screens), approve the vanishing and inspect each print run as they came 'live' off the press. I was able to inspect each pallet for consistency (in printing) and eventually hold a 'dummy' of the book -- to feel its mass and weight. All this was really important to me. The production of a book is a long, involved, detailed process and I wanted the book to come out the best it could be. Matt Harvey (Aperture's production supervisor) and some live mentoring from Nick Brandt (who I consider a friend) was also invaluable to me. I think people will be happy with reproduction of the images in the book. AK: In 2012 you worked with 21st Editions to publish your first books. What are the differences between these publications? MD: It was actually a dream come true to have 21st Editions produce my first two books. What an honor to have a publisher with the reputation of producing some of the most beautiful fine art photography books in the world, ask me if I wanted to produce my first two books with them! 21st Editions is also a publisher with a passion, dedicated to the art of "bookmaking." So we produced both Prism edition and Deluxe edition books. The Prism Edition book was a limited edition of 280 books, each hand bound and unique. The Deluxe Edition book is a limited edition of 39 books in which only 18 were for sale. The book was made up of 12 platinum prints. This was the first time my work had been produced in platinum. The Prism book started at $8,000 (I believe) and raising in price as the edition sold. The edition quickly sold out. The last book sold to the Boston Public Library, which is just amazing to me. In comes Aperture: I was always interested in producing a 'trade edition' book, one that was affordable and available to a wider audience. I was in no rush, but thought if one was in my future it would somehow come to be and I never wanted to force it. Just then Chris Boot, Executive Director of the Aperture Foundation, approached me -- and the book became a reality. The first edition of Storms consists of 5000 English and 3000 German edition copies priced at approx $50. But because the book is being produced by Aperture the book is also of the highest standards, of course, within perimeters. But what made me happy was the fact that Chris Boot was available throughout the entire process, never handing the book off. This included the choosing of the writer of the forward, working with the book concept and design, its typography, editorial, paper choice for printing, image sequencing, etc. The book is a true collaboration. I hope people will be happy with the results. MD: Let your work be your voice. The image is what is important, not any hard selling or hype. Just let your work do the talking for you. Dobrowner's exhibition Storms continues through September 21st, 2013. For more information or to purchase a print please contact Anne Kelly at 505-988-5158 x121 or anne@photoeye.com.